The 1978 Cannes Palme D’Or winner was strongly criticized from the Left in its home country, Italy. 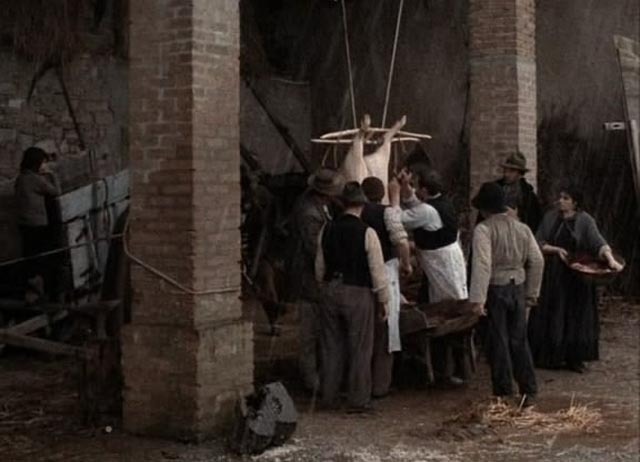 Ermanno Olmi’s The Tree of Wooden Clogs is a meticulous recreation of a time, a place and a way of life which had largely passed away by the time he made the film. Set towards the end of the 19th Century in the Bergamo region of Italy, it depicts the lives of peasant farmers through one cycle of seasons. This was essentially a feudal society little changed since the Middle Ages, with those working the land serving landowners who held little sympathy for their tenants, taking the largest share of the products of their labour. It was as if the upheavals of the past century had passed them by, the incisive analysis of Marx and Engels and the concept of workers’ rights which had grown within the oppressive conditions of the industrial revolution having no influence in this rural region. And yet this was the framework from which the film was criticized; Olmi was accused of being a reactionary, of an insulting condescension towards these peasants whom his critics asserted should have been shown banding together to throw off the yoke of oppression. In other words, where Olmi was recreating a faithful portrait of a harsh way of life, and observing the dignity of the people trapped within it, his critics were demanding an ahistorical revisionism within which they themselves could find comfort. The condescension here came not from Olmi, but rather from his critics. The Tree of Wooden Clogs is a marvel, an utterly convincing evocation of another time and place in all its myriad physical, emotional and social details, made by what we might term an artisinal filmmaker – Olmi wrote, produced, directed, photographed and edited the film himself – using an entirely unprofessional cast drawn from the region who enacted a way of life with which they were intimately familiar. How Olmi managed to draw such natural, unselfconscious performances from these people, from very young children to the elderly, is – as Mike Leigh says in his introduction to the film on Criterion’s Blu-ray – a miracle. Largely improvised, these performances are deep and subtle, infusing the film with an air of human truth which is rare and precious. Although the film runs just over three hours, there isn’t a wasted moment; even though there is little in the way of what could be called plot, it is packed with incident, the daily details of an existence dependent on the land, on unpredictable weather, and on the whims of the landlord and his foreman. Four families – parents, children, grandparents – live in a kind of communal compound built around a muddy courtyard, attached to barns and stables where cows and horses are kept, some owned by the farmers, others by the landlord. 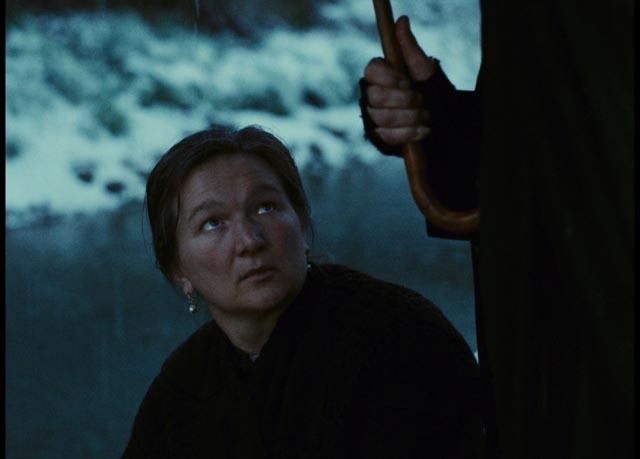 There’s the recently widowed mother of six, forced to spend her days hand-washing seemingly endless loads of laundry at the edge of a freezing stream; her eldest son, a 15-year-old, takes work at a nearby mill and rejects the priest’s offer to remove the youngest children to an orphanage – he swears that he will work day and night to keep the family together, a determination which closes off even this slight possibility that his mother might find some relief. Maddalena, the daughter of another family, shyly courted by a young neighbour, Stefano, prepares for marriage. An older man finds a gold coin on the ground amidst a crowd in the nearby village and unaccustomed to such wealth looks for a place to hide it safely from everyone else; perhaps not very wisely, he packs it in mud in the hollow of his horse’s hoof. And then there’s Batisti, a proud peasant who is pressed by the priest to send his young son Minek to the village school, a four-mile walk from home; Batisti acquiesces although he’s deeply concerned about how it will look to have the son of a peasant going to school. This last thread gives the film its title (and only obviously symbolic gesture); when Minek breaks one of his wooden shoes, his father cuts down a small tree beside a ditch to carve him a replacement, and when the landlord discovers this act of “vandalism”, the family is summarily evicted. The sense of community among the film’s many characters does not, in the end, translate into a sense of solidarity – while the other families feel empathy for Batisti, his wife and children, they have no mechanism by which to band together to oppose the injustice of the eviction, and this finally is at the root of that Leftist criticism; critics like novelist Alberto Moravia saw this as Olmi depicting the peasants as somehow stupid, rather than as people so embedded in a particular way of life that they can’t conceive of an alternative. 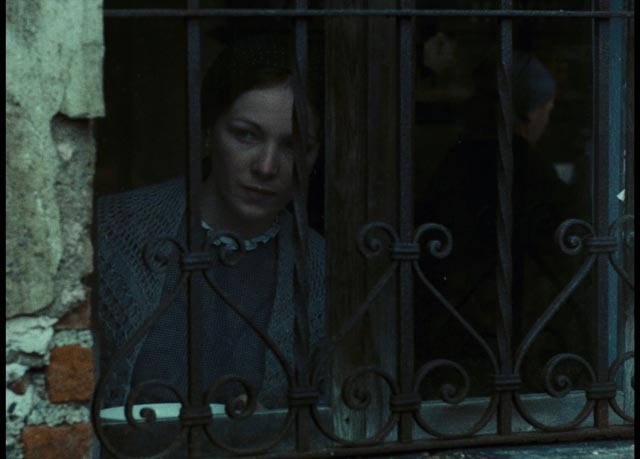 That they are comforted in this life by their Catholic faith only made matters worse; and yet people denied political and economic power have long found emotional support in religion and Olmi’s film simply depicts this fact along with all the other subtle and complicated details of these lives he is observing. This, it seems to me, is simply part of the film’s strength as an observant document of particular lives being lived in a particular time and place; it is rather the poetic gesture of cutting down the tree and carving the shoe that seems slightly false to me. Here, Batisti is taking something from his oppressor in order to give his young son the means possibly to move beyond their oppressive life; education may provide Minek with a way out and something small and insignificant taken from the landlord is needed to aid that escape. But objectively, Batisti has no need to cut down the tree – there are numerous stacks of firewood in the courtyard and surely he could find a piece suitable for his needs there. Only in this one symbolic gesture does Olmi seem to impose himself on his material. 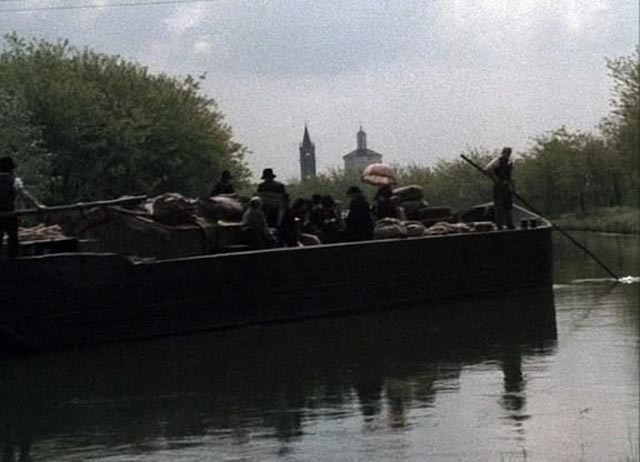 The lengthy digression late in the film, in which on their wedding day Maddalena and Stefano travel by barge to Milan to visit her aunt, a nun, opens the film up visually and allows a more direct political commentary as the young couple witness turmoil in the city’s streets, a clash between protestors and the police, on their way to the convent where the aunt greets them warmly. They spend their wedding night in the convent and in the morning are presented with a young orphan child to take back home with them; this baby comes with a small stipend which will provide the couple with financial support for the next fifteen years. For Maddalena and Stefano, this act of mutually beneficial charity offers far more than the prospect of revolution they have glimpsed in the city. Is Olmi here saying that personal action within a context of religious institutions is the answer to social ills? Or is he being a sensitive observer of the attitudes and beliefs of the people he has chosen to study, whether or not we might agree with those beliefs? 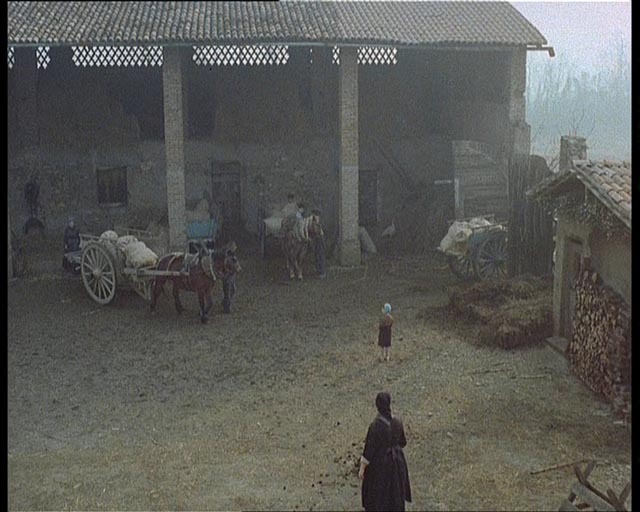 It was in resisting any attempt to overtly critique these peasants’ beliefs that he opened himself up to those criticisms; and yet in refusing to stand apart and pass judgement he made a film which has a timeless quality, appearing now far more authentic and convincing than the film with which it most obviously invites comparison, Bernardo Bertolucci’s 1900 (1976), which attacks a similar vanished world from an overtly political perspective and looks now like an angry tract rather than an organic dramatic evocation of a lived-in past. At the level of craft, Olmi’s work is flawless. His photography is devoid of artiness, never calling attention to itself even as it finds the perfect way to frame every moment, to catch the smallest expressions and gestures of his cast as well as the richness of a landscape so often shrouded in mist. 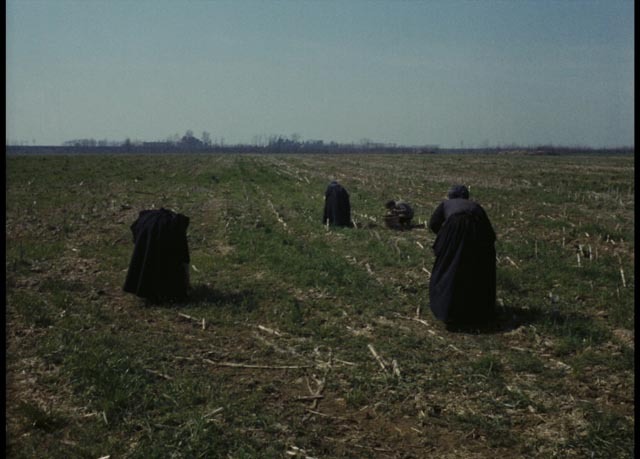 Olmi’s editing flows with the rhythms of life and the seasons. The Tree of Wooden Clogs is one of those rare works of cinema which completely immerses its audience in a fully realized world where the simple ordinary details of life take on dramatic and emotional power. In a sense, it’s the perfect expression of the neo-realist ideal. Criterion’s Blu-ray presents the film in a 4K transfer from the original 35mm negative, restored by The Film Foundation and the Cineteca di Bologna. Olmi chose to use Agfa-Gavaert rather than Kodak stock for the shoot, emphasizing the rich greens and earth tones of the landscape; you can feel the damp chill in the imagery. Financed by RAI Television, the film is framed at 1.33:1, giving the material a greater sense of intimacy than a wider frame may have. The disk includes more than two hours of supplements which give a good account of how the film came to be made and of Olmi’s working methods. “The Roots of the Tree” (52:31) is an episode of The South Bank Show from 1981, hosted by Melvyn Bragg, which combines an interview with Olmi and a visit to the film’s locations. Olmi explains that everything in the film is rooted in the stories his peasant grandmother told him of her own life. He discusses finding the cast members and how he worked with them (typically giving them an idea of a particular scene and then allowing them to improvise from their own experience). Much of the film’s art direction was supplied by the performers themselves, who brought various personal tools and artifacts to the location. Olmi also addresses the political criticisms leveled at the film and, not surprisingly, rejects them as too simplistic. There are two other interview pieces, one from French television at the time of the film’s appearance at Cannes in 1978 (7:08), the other from 2008 (32:31), in which Olmi again discusses the film’s origins and his working method. A panel discussion following a screening at the Cinema Ritrovato film festival in Bologna in 2016 (34:15) features several crew people and cast members who offer perspective on Olmi’s approach to directing. Mike Leigh provides a brief adulatory introduction (7:00), and finally there is a trailer (4:25) which strangely emphasizes the film’s final sequence in which Batisti and his family are evicted from the farm. The booklet essay is by critic Deborah Young. There are two criticisms of the film which seem to be widely expressed. The first (voiced by Roger Ebert among others) is that the film sentimentalizes poverty. This seems to me to be a misreading of the film’s sense of warmth towards its characters. Within the constraints of their lives, they find humour, love and the emotional strength necessary to bear the hardships of their lives. Those hardships are plainly depicted, as is the emotional and psychological toll they take on these people; but to see in their resilience some kind of sentimental valourization of poverty is perhaps an attempt to impose one’s own feelings on the material. Certainly for us, with our freedoms and privilege, these lives would seem virtually unbearable. But the people Olmi depicts do not have our outside perspective by which to gauge their hardships; this is the life they know and they have generations of experience to draw on. To think that people living this kind of life should be shown to be miserable and suffering unrelievedly is itself deeply condescending. The second common criticism (particularly among commenters on sites like IMDb) is that The Tree of Wooden Clogs is “animal snuff”. This is a more problematic point. There are two animals killed on camera – a chicken has its head chopped off and a pig is butchered, the latter in particular being very difficult to watch. This raises questions about the morality of violence towards animals in cinema. No one could object, for instance, to the horrific imagery in Georges Franju’s Le sang des bêtes or other documentaries which expose their audience to the reality of what is done to animals in order to provide us with food. The violence inflicted on animals in a lot of Italian genre movies, however, is quite different; this is real pain and death in a context of entertainment. The two scenes in Olmi’s film fall between these two extremes. The scenes themselves are essentially documentary in nature. The characters are played by peasant farmers for whom butchering animals is simply a part of their daily life and what they do in front of the camera is something quite common to them, treated in an unselfconscious, matter-of-fact way. And the animals were subsequently eaten. Is this real violence justified in what is not actually a documentary, but rather a dramatic reconstruction? To condemn the scenes is to pass judgement on the people we see in the film, people who do these things in the normal course of their lives; or are they being condemned for doing this thing this one time in front of a camera? And if the latter, isn’t the criticism really just a matter of not wanting to be shown something which happens to millions of animals every year, something which provides food for many of those making the criticism? I myself am ambivalent and to some degree judge such scenes on a case by case basis depending on my impression of the filmmaker’s motives. As horrific as the butchery of the pig is in The Tree of Wooden Clogs it nonetheless seems to me to be an honest representation of a very specific reality. This entry was posted in Review and tagged Blu-Ray, Criterion, Directors, Historical Film, Italian Film. Bookmark the permalink.